Here's a simple strategy walkthrough guide for your Temple Run 2 game app. Play with the new environment, obstacles, powerups and achievements! 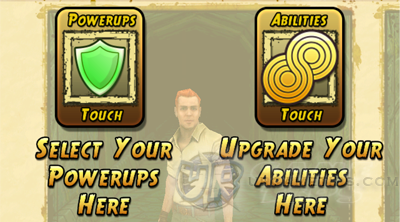 Learn what abilities to upgrade and powerups to use here to quickly progress through the game. - Tilt Device to the Left or Right: Change lanes or stay on a lane. Coins to stay alive! This is pretty helpful for completing some objectives or when you are in the mines. - Before getting Powerups in mid air, check if you can land on a safe place first! - If you run into a cliff, you can quickly jump then tilt your device into a safe place. and you will not be able to jump for a few seconds. - Do your objectives till you reach Lvl 5. - Farm Gems and Coins while running unless an objective requires you not to. - For now, only use Gems and Head Starts for completing objectives! - Notable Objective - Run Without Collecting Coins. - Notable Objective - Power Collector: Unlock a 2nd Powerup. 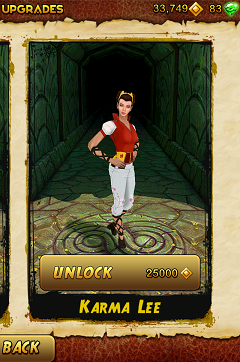 - Simply unlock Scarlett Fox (5,000 Coins). - Unlock and start using Coin Magnet Powerup at Lvl 5.
upgrade your abilities and Powerups! and triple Coins after 2000 meters! - Coin Magnet: Upgrade to increase duration. - Power Meter: Upgrade to use your equipped Powerup more often. - Notable Objective - The Spartan: 1 Million without Powerups. you complete this and all upcoming task. Make sure that you will not use or get any Powerups while doing this task. Getting Gems and Coins would be fine though. - Only use Save Me if it will only require 1 Gem to conserve your Gems. - Notable Objective - 10k Runner: Run 10,000 meters. - Use Shield or Boost Powerup. Upgrade them too if you want. - Save Me will greatly help you here, continue upgrading this. - Notable Objective - Minor Miner: 100k Coins: Just farm them through runs. and Power Meter at this point of the game. - Notable Objective - 5 Million Club: Score 5M Points. - Continue upgrading Save Me and Score Multiplier until you complete this task. - Notable Objective - Jackpot: Collect 5 Gems in one run. - Start upgrading Pickup Spawn to at least Lvl 3 or 4.
you might get 2 more Gems if you are lucky. - Farm and use your Gems to boost your progress. Magnet will do just fine too to complete Coins related Objectives. objectives. 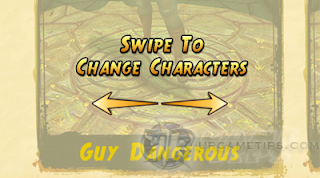 Use it also to save your character from "unavoidable situations" by activating it right before you land or hit a river, a large spiked wood trap or any object or place that will end your run. abilities except for the Head Start. Some abilities will require 50,000 Coins to upgrade, so upgrade what you think is best for your gaming style. - Upgrade Head Start after maxing all abilities then earn Coins for this. Powerup. More Gems will generate higher Scores by using the Save Me option! - I recommend using Boost Powerup! situations" by activating it right before you land or hit a river, a large spiked wood trap or any object or place that will end your run. - Max Score Multiplier to increase your Points gain per run. - Max Save Me, Power Meter, Pickup Spawn to boost up your High Score. - Max Shield Duration and Boost Distance to keep you running without worry! - Max Head Start to use your extra Coins. - Note that your High Scores will greatly depend on your performance. - Practice a lot and break your own or your friends' High Scores Good Luck!